Does for rock and roll what The Sound of Music did for hills. You're about to get personal with one of music history's greatest and loudest heavy metal bands, Spinal Tap! Whether or not you're a die-hard fan of the group, you'll love this detailed "rockumentary" of Engand's legendary Spinal Tap. Acclaimed commercial director Marty DiBergi takes you behind the scenes for an intimate look at a band whose time has come and gone and come again. Through interviews, rare footage and lots of musicincluding classic Tap tunes like "Big Bottom" and "Hell Hole", you'll get acquainted with David St. Hubbins (lead guitar), Nigel Tufnel (lead guitar), Derek Smalls (lead bass) and every drummer who ever lived and died for this renowned rock band. Be a part of the sights, sounds and smells of this celebrated heavy metal phenomenon. It's an experience you'll never forget. $30.835 thousand on 3 screens. My first viewing of This Is Spinal Tap occurred during the film's general theatrical release in 1984. Actually, I took it in on my 17th birthday, and while I thought the movie was entertaining, I can't say I felt bowled over by it. The picture had received glowing reviews, and I simply didn't think it deserved such a fuss. Slowly I changed my opinion. The magic of home video meant that I could re-experience the film at will, and I took full advantage of that ability. I have no clue how many times I've watched Tap to date, but let's just say it's a lot; I won't claim it's the greatest movie ever, but I think it's in the ballpark, and I might just argue it's the finest comedy on film. To quickly summarize the picture, it offers a documentary look at the first tour in a few years by an English heavy metal band called Spinal Tap. Though they once were hugely successful, the years have not been kind, and as of the early Eighties - the time in which the movie was made - they're struggling with their current status, and this escalates the tensions in the band. Actually, another factor that complicates the "reality" of Tap stems from the fact that they sort of did become a real band. 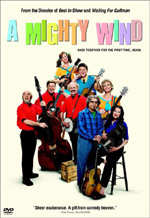 In a way, they always were; even though the group was conjured for the film, the actors nonetheless wrote and performed their own songs, and Tap has even toured sporadically over the last 25 years. So I guess I can better understand some folks' confusion about the issue of Tap's true-to-life existence, but it still somewhat surprises me that so many believe they're a regular band, especially if those people have seen the movie. I mean, c'mon! While Tap takes some real rock-band-on-tour situations and duplicates them, the emphasis is so heavily on the absurd and the comical that I don't understand how anyone could not get the gag. Perhaps it's a testament to Rob Reiner's skill as a filmmaker that so many have missed the joke, for Tap indeed plays like real documentary. Even when the subject matter seems absurd, it's always presented with a straight face. This was his first directorial effort, but none Reiner’s later efforts show the same level of quality and assurance. Simply put, this is a virtually-perfect film, with almost nothing about it that I would change. The movie features a negligible plot at best, but that makes sense since it's supposed to emulate a documentary. Actually, a storyline does develop once Jeanine (June Chadwick), the girlfriend of singer/guitarist David St. Hubbins (McKean) appears on the scene; a "Yoko Ono" plot begins that causes some dramatic activities in the film's final act. Some regard the last third of the movie as less strong than the first two acts, but I disagree. Yes, the final 25 minutes of so offer less material that's broad and quotable, but I think they're at the heart of what makes Tap so special. This isn't just some hatchet-job parody of a rock band that mocks, mocks, and mocks some more. Sure, the filmmakers have a good time with the excesses of the musicians but their affection for the subject remains clear at all times. No matter how stupid the characters may appear, the participants maintain a humanity about them that lets them resonate with us. That's why the final third of the film is so crucial to its enduring appeal. The trials and tribulations of the band become more believable, and the situation grows dim. The events depicted add to the tone of the movie in that they create an emotional release at the end and they allow us to buy into the characters more. These aren't just cartoon buffoons; they're folks about whom we care. A lot of that credit has to go to the amazing cast. As the main members of Tap, McKean, Guest (guitarist Nigel Tufnel) and Shearer (bassist Derek Smalls) have iffy grasps on their English accents but otherwise perform their roles perfectly. I remember when Tap first appeared, I couldn't imagine it was any good. After all, it starred some unknown (Guest), Lenny from Laverne and Shirley (McKean), and an unmemorable member of Saturday Night Live's cast (Shearer). All that and it was directed by Meathead, who also acted in it as documentarian Marty Di Bergi – it sounded like a recipe for disaster. How wrong I was! The acting thoroughly convincing at all times and the participants truly "become" their characters. As I mentioned earlier, Tap succeeds partially because it never actively lets you in on the joke. There are no asides to the cameras or glib references that tell you it's all fake and phony; the whole production is played straight. Some sublime editing adds to the effect. Tap never dallies or tries to milk jokes; once punch lines are delivered, the film usually cuts very quickly to the next scene. The changes aren't done in an abrupt or unnatural manner. In fact, the edits always feel smooth and fluid. More importantly, they make sure the movie proceeds at a rapid and appropriate pace. Tap remains one of the best edited films I’ve ever seen. Frankly, I could go on for hours about all the reasons why This Is Spinal Tap is such a great movie, but I'll stop here. Suffice it to say that the film is an exquisitely crafted piece that offers terrific performances, strangely endearing characters, and a great deal of wit. It's an absolute classic that hasn't aged a day over the last decade and a half. To put it bluntly, it doesn't get much better than this. 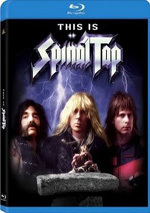 This Is Spinal Tap appears in an aspect ratio of approximately 1.85:1 on this Blu-ray Disc. The quality of the image seemed adequate but it clearly shows the limitations of the original material. After all, Tap was shot cheaply on 16mm film; as such, it never will - or should - look terribly clear or crisp. My "B-" mainly reflected the overall look of the image and disregarded the budgetary issues. Sharpness was erratic. Some shots demonstrated decent accuracy, but most came across as a bit soft and fuzzy. This stemmed from the 16mm stock as well as the “on the fly” documentary shooting style. No issues with jagged edges or shimmering occurred, and edge enhancement was absent. Source flaws were essentially absent. Grain fell within logical levels, and only a couple of small marks appeared. Colors also were up and down. At times, they showed good vivacity, but they often seemed a bit muddled and messy, and skin tones could seem somewhat ruddy. Blacks were pretty good, and shadows showed reasonable clarity; neither excelled, but both seemed fine. Once again, I don't fault the transfer for the various concerns. This Is Spinal Tap looked okay but not very good, and bless it for that. A more polished appearance would seem inappropriate for this kind of film. I didn't feel comfortable giving it a higher grade than a "B-“ but I have no complaints about the image; it looked the way it should. I thought the DTS-HD MA 5.1 soundtrack of Tap offered less equivocal pleasures, as it really sounded great. The soundfield stayed largely monaural for the most part. Much of the audio came from the center channel with a few notable exceptions. Some broader locations - like the cocktail parties or lobbies, or when we saw planes fly overhead - featured a light but convincing spatial quality on the sides. It's gentle but it provided a little extra dimension. The mix really came to life is during the concert segments. The soundtrack presented some great scope to the songs, as they spread distinctly and effectively to the sides. The surrounds also kicked in with some great ambience. For the most part, the rears offer a general reinforcement of the songs and some crowd noise, but some speaker-specific music emanated from there as well, and the whole thing came across in a lively and involving manner. Audio quality appeared excellent. I found the dialogue to sound surprisingly warm and natural. Very little of it seemed to be dubbed, and considering the cheap production values of the piece, I thought speech seemed quite clear and smooth. Effects were a relatively minor component of the film, but they seemed clean and realistic, with no signs of distortion. The best aspect of the mix was the music, which never sounded better. Although all of the songs were recorded in the studio, I've always been impressed by the wonderfully "live" feel they display in the film, and the effect was even more convincing here. The tunes showed great clarity and dynamic range; highs were clean and crisp, and the bass sounded taut and rich. The track lacked the ambition to deserve a really high grade, but I still felt impressed by it. 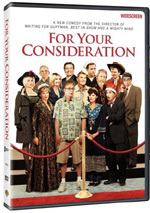 How did the picture and audio of the Blu-ray compare to the 2000 Special Edition DVD? Both showed improvements, though primarily in the visual realm. Both offered pretty similar audio; the lossless DTS mix was a bit better than the DVD’s Dolby Digital track, but it wasn’t a revelation. When I watched the Blu-ray, I expected to indicate that it looked about the same as the DVD. That was before I rewatched the DVD and directly compared it to the Blu-ray. Though the Blu-ray showed the inherent problems with the original footage, it cleaned things up quite a lot and offered a much better representation of the film. In contrast, the DVD suffered from a lot of source flaws; it also showed edge enhancement, murkier colors, and noticeably weaker definition. The film will never look great, but the Blu-ray provided a much improved version of the original material. Most of the DVD’s extras reappear here; we lose a couple of bits but add a few new ones. We get an "in character" audio commentary from the three band members. When I first learned of this track, I feared the worst, as this kind of faux performance art can be extremely lame, and there's too much of a "wink wink, nudge nudge" attitude that's come to surround Tap over the last 25 years. You may have noticed that this review contains absolutely no Tap quotes, and that's because I've grown tired of all the hipster-doofus tone around the production. Frankly, the continued "existence" of Tap as a semi-band is not something I particularly like. The movie's so perfect that additional attempts to recapture the magic come across as forced and lame. Better to leave it all alone and not ruin the legacy. That said, the "character commentary" was much more entertaining than I expected. Of course, it provides almost no information about the making of the movie itself, but it makes for a frequently funny look at the "reality" of the period. The band fill in the gaps about what we didn't see in their lives, and they gripe a lot about how poorly they were treated by Di Bergi and other characters. Ultimately, I'd prefer a track that provides a nice discussion of the creation of the film, but this one's pretty clever and witty. Next is Catching Up With Marty Di Bergi, another "in character" piece that features an interview with Reiner as the documentarian. The program runs for five minutes and intersperses statements from Di Bergi with some film clips and a couple of shots from a modern Tap press conference. It's nothing special but the piece is entertaining in the same manner as the audio commentary, and it's short enough to keep from wearing out its welcome. In the Rare Outtakes domain, we find 14 clips. Each of these ranges from 19 seconds to nine minutes, 45 seconds, for a total running time of 67 minutes and 51 seconds. It's a good collection that offers a nice look at some of the shots that didn't make the cut. The majority of them are entertaining, and as a dedicated Tap fan, I'm more than delighted to have them, but I'm glad they were omitted. Some of them might have worked well in the movie, but a lot would have seemed redundant, and the scenes they could have replaced are better. Some seamier material appears here as well, such as more explicit involvement in drugs, and a deeper look at the groupie scene. Perhaps "explicit" is the wrong word, as there's nothing raunchy or nasty; however, the filmmakers wanted to keep the tone lighter so almost all mention of drugs is omitted, and only peripheral info about groupies appears. In any case, I think the final 83-minute cut is virtually perfect, so while I like being able to see all of this unused material, I'm glad none of it made the film. From the "Tap Archive", we find two clips. The first is the Flower People Press Conference. This one-minute and 49-second piece shows the band at a Beatle-esque question and answer panel; it’s really another deleted scene. It's very funny and entertaining, but would have been inappropriate in the movie; the few glimpses of earlier incarnations of the band work in the film because they're restricted to performance clips, but this conversational snippet would have taken us out of the "reality". Further stretching the boundaries of real world and the fake is a brief clip from the Joe Franklin Show. We find the final two minutes of Tap's mid-Eighties appearance on that program. From what we see, it seems unclear if Franklin and the other guests are in on the joke. It's too brief and insubstantial to offer much information, but I was happy to see it. When we enter the Music Video section, we find some more good clips. 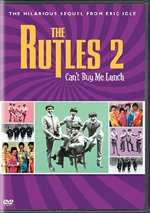 "Gimme Some Money" presents the entire song from the faux-Sixties TV performance shown in the movie. In a similar vein is "(Listen to the) Flower People", which offers the whole Jamboreebop version of that tune, which we also see excerpted in the film. Both are beautifully done and it's wonderful to have them in their entirety. Another unedited movie segment appears in the form of "Big Bottom". We saw parts of the song in the film, but this piece gives us the whole tune. A more formal music video can be found as well. "Hell Hole" is given the then-typical treatment for metal vids; if you're old enough to remember the era, you'll find it clever and witty in the way it apes and mocks the conventions of the period. The clip has no formal connection to the movie; it takes a conceptual air and features no film snippets. In the "Promotional Materials" area, we get a fairly traditional theatrical trailer for the film's original release plus we find the famed "Cheese Rolling" promo. The latter shows Reiner working at the editing desk; he says that he can't show any clips from the movie since they're still making it, so he offers some shows from a fictional festival in Scandinavia. It's unusual and delightful. Another untraditional promotional piece arrives in Heavy Metal Memories, which takes the form of an ad for one of those cheesy K-Tel hits albums. It provides a very fun way of introducing and promoting the film. Finally, this section ends with three different 30-second TV ads. None of these are anything unusual; they do the typical job of making us aware of the film's existence. I regarded the Commercials section as an odd prospect; didn't we just see all of the promos for the film in the previous area? Nope, as we get three different ads for something called “Rock and Rolls”, which appears to be a Hot Pockets kind of pastry. I couldn't figure out the actual time frame of their appearances, but I'd guess they came from the early Nineties, and they show new clips of the band as they promote this product. It’s odd but it makes for a cool addition to the package. A bonus DVD throws in some materials not found on the 2000 DVD. We find a performance of “Stonehenge” from the 2007 Live Earth Concert. This clip runs six minutes, 55 seconds as it shows the band at the massive event. Forced whimsy doesn’t work very well, so the tune fails to prove to be terribly entertaining. We also locate a National Geographic Interview with Nigel Tufnel. Done to promote a Geographic film about Stonehenge, the eight-minute and 15-second piece offers Tufnel’s thoughts about that location. It offers moderate amusement. And that’s it! I’m not sure why they needed an extra disc for barely 15 minutes of material. It seems like a waste, though the content is decent. At least the Blu-ray loses almost nothing from the DVD. It drops a booklet with some character information, and it also omits the clever in-character voiceovers that open the DVD. I’m not sure why the Blu-ray loses these elements, but at least they’re minor deletions. This Is Spinal Tap is one of the all-time classics, a nearly-perfect comedy that continues to work amazingly well more than 25 years after its original release. If it loses any points, it’s simply due to overexposure; Tap is such an influential film that it’s become ubiquitous. The Blu-ray’s picture offers a good representation of the source material, and it gives us very good audio along with a nice collection of extras. This is the best presentation of Tap yet released on home video.